Quail eggs are small and cute. But don’t underestimate them. Even with their small size, their nutritional value is three to four times greater than chicken eggs. Quail eggs contain 13 percent proteins compared to 11 percent in chicken eggs. It also contains 140 percent of vitamin B1 compared to 50 percent in chicken eggs and provides five times as much iron and potassium. Unlike chicken eggs, quail eggs have not been known to cause allergies. Actually they help fight allergy symptoms. Shell the eggs and make 2-3 horizontal slits on them. When it sputters, add curry leaves. Add ginger garlic paste and saute on low flame till it becomes almost brown. Add all the powders and stir for a minute. Add water, vinegar and salt and let the mixture simmer for a minute. Take off fire and add quail eggs and mix well. Serve as a side dish and store leftover in refrigerator. 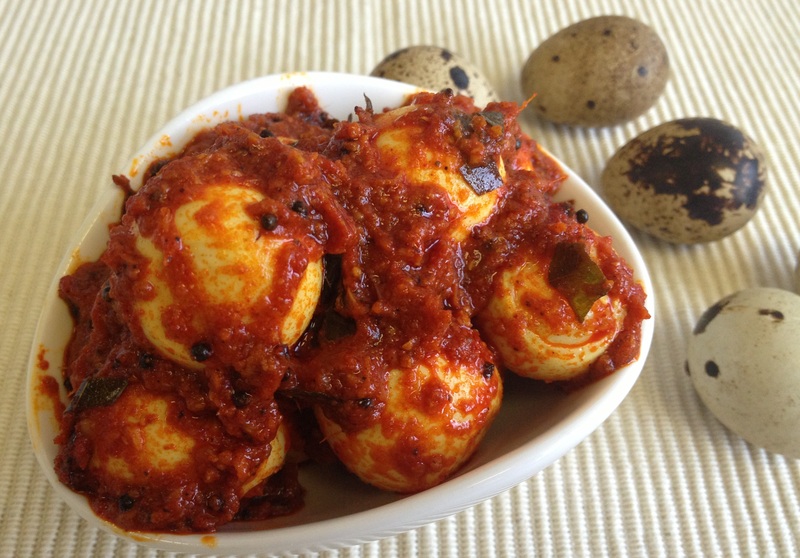 This entry was posted in Non Veg: Eggs and tagged kada mutta, kada mutta achar, picke, quail egg by PriyaBaby. Bookmark the permalink.